Whether relaxing at home, on the road or in the air, or sitting by the side of the pool at a fancy resort, your kids will need some great reads to keep them chilled and entertained all summer. 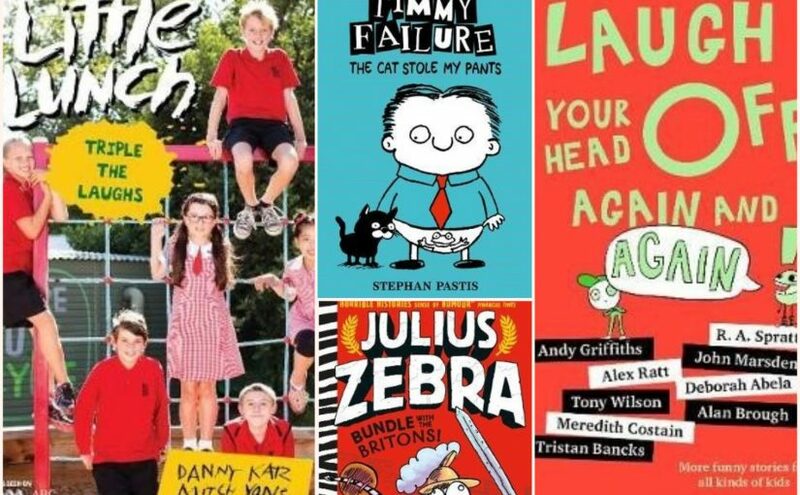 Here are a few funny books from popular series for middle graders that will have them enthralled from start to end. 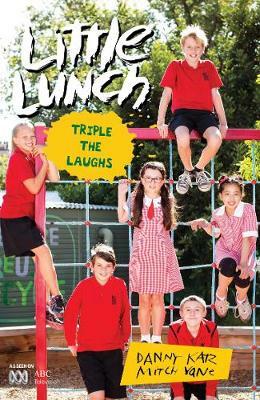 Logie-award-winning television series by Danny Katz and Mitch Vane, Little Lunch is the perfect school-based comedy to read when school is out. Triple the Laughs, fourth in the illustrated book series, contains three immersing stories that will have kids snorting and chortling all the way through. In ‘The Ya-Ya’, Atticus learns to appreciate his grandmother’s cooking after a long episode of avoiding the small, brown, smelly things in his lunchbox that look and smell like something you scrape off the bottom of your shoe. ‘The Dress-Up Day’ is about Battie using the alias of superhero, Stretcho, to hide the fact that he is really scared of a lot of things, including moths, crabs, knees, and especially dogs. The third episode involves Melanie being punished and unable to eat her piece of ultra-choco-happiness cake because Tamara has put ‘The Germblock’ on her following a visit to the toilets. But did Melanie really not wash her hands? Rory seems to know the answer! Hilarious, authentically appropriate (and sometimes perfectly inappropriate) antics that readers from age seven will relate to or simply have a good old chuckle about, Little Lunch Triple the Laughs is a winner. 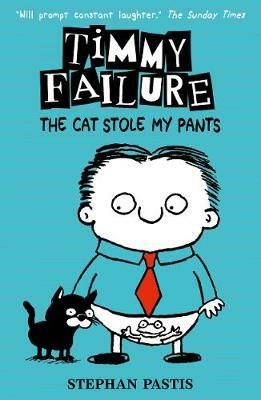 Number six in this comedic Timmy Failure series by Stephan Pastis is ‘The Cat Stole My Pants’. The injudicious boy detective is back with another mission to achieve Greatness, this time on an island in Key West, Florida, apparently NOT on holiday / honeymoon with his mum and new step-dad, Doorman Dave. The graphic novel for tweens sets sail with a pair of missing (or stolen) pants whilst touring the house of famous author, Ernest Hemingway. It then takes us through a sea of laughter as Timmy’s scepticism and hypochondria are a consistent source of his ‘failures’. His social and relationship building skills are tested via interactions with Dave, and Dave’s nephew Emilio, which of course Timmy exploits, I mean, recruits as an ‘unpaid’ intern in his detective agency. Their mission is to solve the mystery of the mysterious note-dropper and a hidden treasure somewhere in the town, leading to a gloriously unexpected and emotionally imposing resolve. All the while, Timmy’s elusively illusive polar bear agent is apparently, according to Timmy, extorting money for a book report required for his summer school homework. But someone else more reliable is there to save Timmy from his unscholarly ways. With its sarcastic and dry wit, quirkiness, unbelievable yet somewhat uncannily familiar circumstances, and comical illustrations, The Cat Stole My Pants delivers an unputdownable read packed with action, mystery and lessons in (perhaps how to not) handle new and estranged relationships. Set to steal the attention of children from age eight. Walker Books UK, April 2017. Laugh Your Head Off Again and Again! is the third in the super-charged, action- packed comedy series blessed with an unbelievably talented array of popular Australian authors. 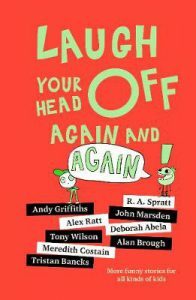 Featuring stories from the Treehouse’s Andy Griffiths, R.A. Spratt, John Marsden, Tony Wilson, Meredith Costain, Alex Ratt, Tristan Bancks, Deborah Abela and Alan Brough, plus fantastically funny sketches by Andrea Innocent. Again, another ‘brilliantly coloured’ book; literally so eye-blindingly bright you can’t miss it on a bookshelf, but also contextually vibrant in nature to keep its readers totally entranced from neon-green chapter to neon-green chapter. Nine stories cleverly unfold within the blood-orange cover containing a mix of the unexpected, frightening, enlightening and ridiculous. From a life-threatening shower ordeal, to three greedy pigs and a wolf pie, a psychotic childhood clown come back to life, a high-flying ‘Bum’, to an abandoned girl forging a life of cake and Royalty. Each one different, each with its own voice and level of intensity. Recommended for middle graders, however make note, this edition is not for the faint-hearted! The authors have definitely turned it up a notch compared to the prequels in terms of ‘scare factor’ and complexity. Some truly nightmarishly frightening with others making you question who you can trust. But all in all, Laugh Your Head Off Again and Again! 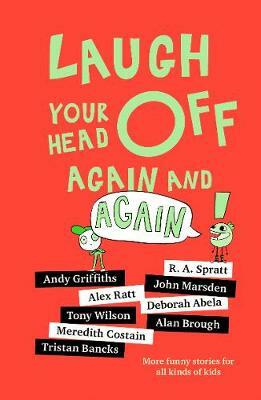 is a ludicrously entertaining collection of stories to thrill every sense of humour. 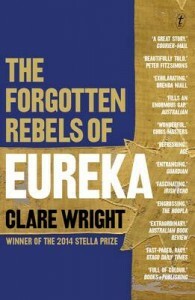 Pan Macmillan Australia, October 2017. Now here’s a raucously Roman romp of colossal proportions! 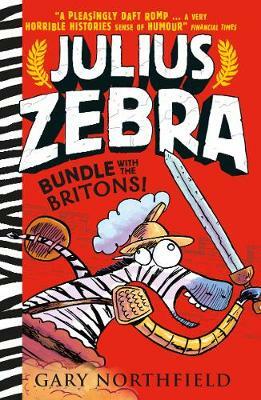 Julius Zebra: Bundle with the Britons! by Gary Northfield is the second hysterically historical book in the series, brilliantly mixing fictional absurdity with non-fictional goodness. It is charged with a chariot-load of droll, and senseless, humour, and insanely wacky black and white illustrations neatly slotting into the storyline throughout. There is also the inclusion of authentically pertinent details of the ancient era with its Roman numeral numbered pages and facts on what the Romans brought to Britain at the closing. This is the story of The People’s Champion, gladiator Julius Zebra, and his animal cronies on a mission for granted freedom. Emperor Hadrian, the villain in this tale, has promised this outcome on the grounds that Julius defeats the Britons, to win governance of the Roman Empire. Led by Septimus, the boss of the gladiator school, the animals are taken unwillingly to the far-off land of Britannia for a final shot at victory, only to realise their perpetuated slavery will remain unless they stand up for themselves. This does not come without a series of daft and imprudently courageous attempts to outsmart Septimus, their opponents and the Emperor. Teamwork, friendship and loyalty are at the heart of this fast-paced scramble to freedom. Bundle with the Britons is zany, zesty and zebra-tastic, seizing its middle grade audience with every rip-roaring joke and clanging bangs of energy. 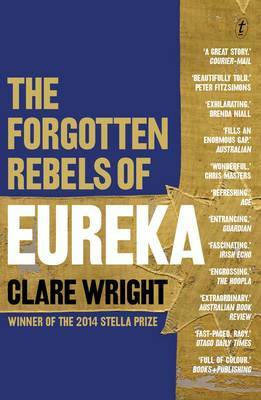 Walker Books UK, May 2017. 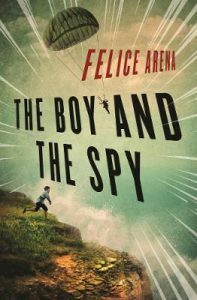 Felice Arena and Tristan Bancks have both written extremely exciting, atmospheric books for boys this year (and girls like them too). You both have distinctive first names. Where are they from? I was named after my grandfather – a longstanding tradition for many first-born sons in Italian families. Felice is pronounced Feh-LEE-che. Imagine growing up with that name in Country Victoria! Felice actually means ‘happy’ in Italian. And it pretty much reflects who I am – happy by name, happy by nature. My family and friends these days just call me ‘Fleech’ for short. Occasionally I get Felix, which is the English version of Felice (but that just makes me think of the cartoon cat). You have both written an enviable backlist of books for boys. Could you mention some of these titles? The Specky Magee series, Sporty Kids, the Andy Roid series, Whippersnapper, and The Boy and the Spy. I really enjoyed your gripping books published this year. Could you tell us about them – Felice about The Boy and the Spy and Tristan about The Fall (in the next post)? The Boy and the Spy is a fast-paced WW2 adventure set in Sicily. A twelve year-old Antonio, an orphaned boy, has a chance meeting with an injured American spy hiding out in a grotto, the story launches into a heart-stopping story with action aplenty. Readers are kept in suspense as Antonio helps the spy evade German soldiers and gangsters, make contact with the Allies, and try to find a way to escape the island alive. An important theme carried throughout the story is the notion of family and how we define it. Where are they set and how did you create the sense of place? Wartime Sicily. My mother comes from that Italian isle and I still have relatives there. I’ve been to Sicily several times so I have a real sense of the terrain, which helped when writing the story. As far as the specific time period goes, that took a little more research, but I was able to consult with some family members to help authenticate the tone and settings in the book, and to capture 1943 in the dialogue, details from everyday life, and conditions related to the war. How do you hook readers quickly into your story? I love writing movement and action in my stories. A fast pace from the outset can engage some young reader who might not have the patience or attention span to read a slower unfolding plotline weighted down in meandering development. Adding a little movement with a sense of jeopardy or obstacles to overcome early on in the story is a good way to hook young readers quickly. Once they’ve connected with the characters in this way they’re more willing to pay attention to the deeper undercurrents of the story as they emerge farther along in the narrative. Who are the major characters and why are they in this predicament? There’s Antonio, an orphaned boy who is frowned upon and pretty much invisible in his seaside town. WW2 is the backdrop to his story, but for Antonio his daily battle is with prejudice. So when he meets a man who has literally dropped from the sky and talks to him as an equal and is desperate for his help, Antonio’s sees a chance to prove himself and deepen his own sense of self-worth. But with this unlikely alliance comes danger – the man is technically the enemy and Antonio is putting his life at risk to help him. How is the writing style different from some of your other work? This book heralds a new writing path for me. I’m known for writing contemporary sports-themed stories, and usually in third person. This book and my next book are written in first person and play out in a specific historical time and setting. I’ve wanted to write in this style for a long time, and I’m happy that it’s resonating with readers. What do you think about each other’s book? I loved it. And I’m not just saying that because I know Tristan. What I admire about Tristan’s writing in this story, The Fall, (and Two Wolves) is that he never talks down to his reader. He doesn’t dumb it down. It’s smart and sharp writing, and it’s visual. I think Tristan and I share a love of cinematic storytelling. We both come from TV/film backgrounds, and I think this definitely comes through in our writing. These books are both published by Penguin Random House. Do you cross paths because of that? Share editors? Go to meetings together? We don’t share editors or go to the same meetings but we’ve attended the same events and festivals – and have also shared the stage. Last year for PRH we gave a reading performance of Roald Dahl’s Fantastic Mr Fox at Federation Square in Melbourne. We’ve talked about doing more events together. 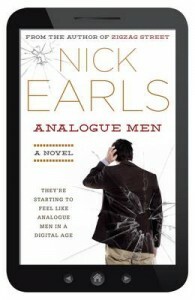 What other books for boys would you recommend – recent and older? Anything written by Michael Morpurgo, Neil Gaiman, Frank Cottrell Boyce, John Flanagan, David Almond, Gary Paulsen, Brian Selznick, Morris Gleitzman, Robert Newton, Adrian Beck, and… Tristan Bancks. I’m putting the final touches to another historical action story set in Paris in 1910 called Fearless Frederic. It’s about friendship, adventure, and what it means to have courage. It’s due to be published by Penguin Random House Australia April 2nd 2018. What is significant to you about meeting your readers – as individuals or in a large group setting? It’s incredibly significant. There’s no other joy like watching young readers hang onto every word you say as you read aloud to them. I would never pass up the opportunity to help jumpstart a love of reading in our next generation of book lovers. It’s also a chance for me to garner feedback and test out ideas – kids are brutally honest and will let you know if they like something or not. Thanks Felice, and all the best with The Boy and the Spy and your other books. 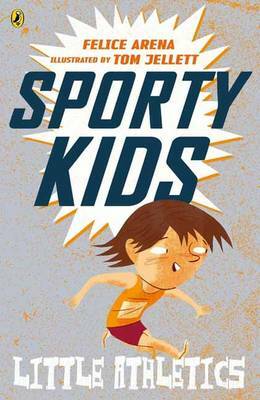 Tristan Bancks and Felice Arena have both written extremely exciting, atmospheric books for boys this year (girls like them too). Tristan was one of the knights of the round table. It can mean ‘noise’ or ‘boldness’ or ‘sorrow’. Certainly, there are notes of boldness and sorrow in my novels and my teachers always told me I was unnecessarily noisy. THE FALL is inspired by a crime scene I visited doing work experience with a news crew when I was in high school. A man had stolen a woman’s handbag, run through a park, jumped over a fence at the back of the park and didn’t realise that the park was built on top of a multi-storey carpark which was built into the hillside. This and my love of the Hitchcock thriller REAR WINDOW collided to inspire the story. THE FALL is a kind of crime, mystery, suspense, thriller. But it’s not just characters servicing plot. I try to write characters that you care about and I want to explore big ideas that are relevant to middle-grade readers. THE FALL touches on mortality, rites of passage for kids and what it means to be a good human and family member, to make good choices. Most of the book is set in a single apartment building over the space of twenty-four hours. I set myself that challenge and it makes the book quite intense. The building is in Sydney, very much like a building a friend of mine lives in, which is only about 100 metres from the crime scene that I visited back when I was sixteen years-old. It’s also influenced by the apartments I stayed in while travelling in England and Europe for four months during the writing of the second draft. 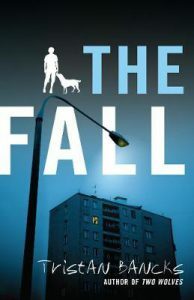 THE FALL begins at 2.08am in a fifth-floor apartment with Sam waking to hear two men arguing in the apartment overhead. Moments later he witnesses a crime. The perpetrator of that crime realises that Sam is the sole witness and comes after him. This sets the drama in motion, with Sam becoming increasingly entwined in the crime as the story progresses. Books need to start with a bang but, when they do, as an author you need to ensure that the rest of the story lives up to the opening and that the end is even better. Sam Garner is twelve-going-on-thirteen. He has never met his father before this week. 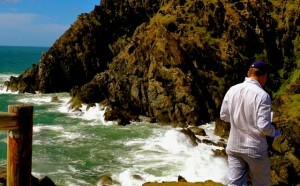 He grew up in the Blue Mountains (not unlike myself) and his father left before he was born. His mother has never wanted him to see his father and his dad hasn’t exactly been breaking his neck to get in touch either. But, after having an operation on his knee (as I did when I was thirteen), Sam’s Mum has to work and she finally allows Sam to go and stay with his father, Harry, a newspaper crime reporter, for a week while he recuperates. On his second-last night, he witnesses the crime. 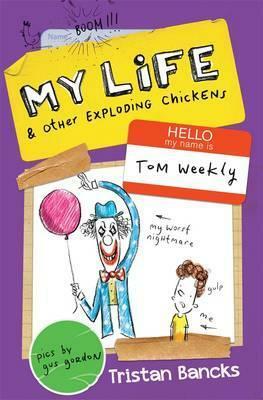 It’s very different to my younger, funnier illustrated short stories in the Tom Weekly books. There is humour in THE FALL but it’s darker, more thrilling and it explores bigger ideas. It’s more in the vein of TWO WOLVES. I hate Fleech’s book. Kidding. It’s actually my favourite book he’s written. 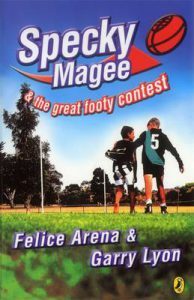 I really like SPECKY MAGEE but I think ‘THE BOY AND THE SPY’ is another step up. 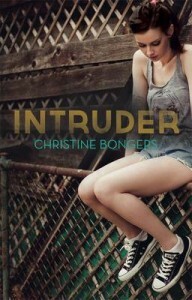 It has a thrilling opening scene but the book isn’t just about action. The characters are rich and believable and it’s told against the backdrop of an important and exciting historical moment. My fourteen year-old son just devoured it a few days ago, too. 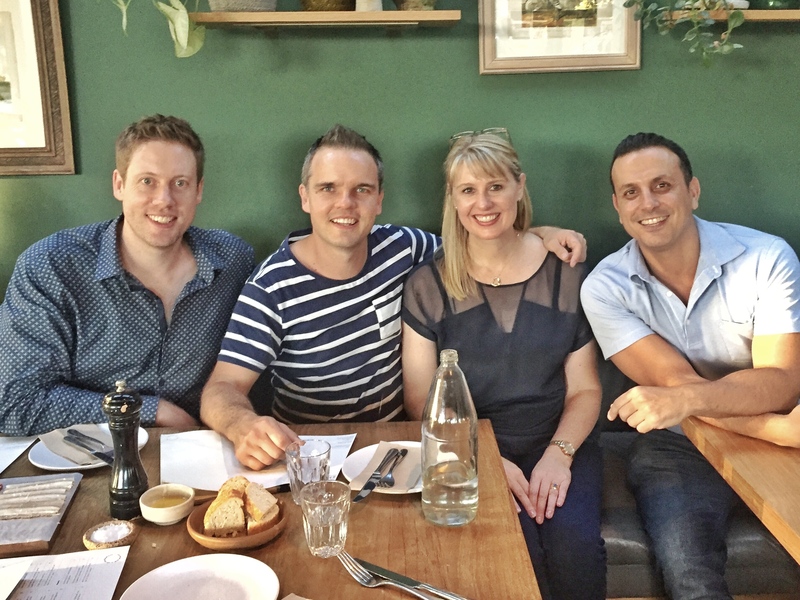 We see each other a few times a year at dinners and festivals and when I’m in Melbourne I’ll see if Fleech is around for a catch-up. We have a shared history in that we both started out as TV actors, both lived in the U.K. for a few years. 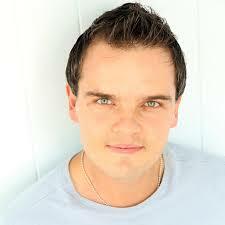 In fact I interviewed Felice when I was presenting a TV series in the U.K. and he was performing in a musical. 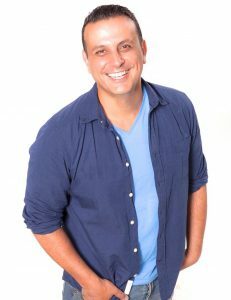 He is a super-energetic entertainer and we both like the idea of using video and performance to bring books to life for kids. I’ve just finished the next book of short stories in the TOM WEEKLY series and Gus Gordon is illustrating it now. 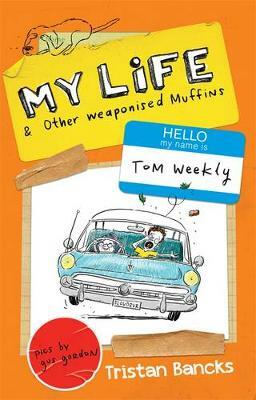 It’s out in 2018 and features stories in which Tom tries to eat a car, his guinea pig is taken hostage, his grandmother involves him in a plot to steal a prize fruitcake, he is attacked by a gang of killer possums and he believes that he and his bum have the potential to save the world. I’m also writing a new crime-thriller called DETENTION about a kid involved in a school lockdown who comes face-to-face with the threat. I imagine it’ll be out either 2019 or 2020. I like to let the novels breathe so they take a few years to evolve. It’s a great complement to the writing work. Writing is intensely personal and sometimes lonely. I love going out and trying new stories and ideas on readers. I love visualising the stories and bringing them to life with anecdotes and images and video and music. 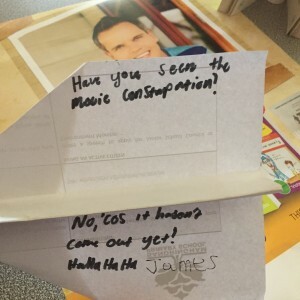 It’s fun mucking around with ideas, hearing what readers respond to and hopefully inspiring kids to pick up a book or create their own stories. Thanks Tristan and all the best with The Fall and your other books. 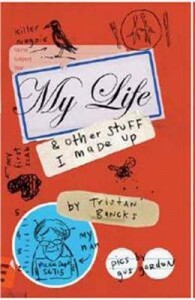 Meet Tristan Bancks, whose latest book is My Life and Other Exploding Chickens. Thanks for speaking to Boomerang Books, Tristan. 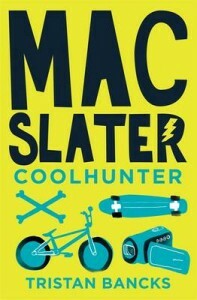 It’s fantastic that one of my favourites of your works, Mac Slater Coolhunter is available again. Two Wolves and My Life & Other Stuff I Made Up are the biggest sellers, I think. 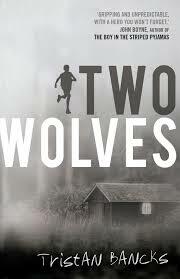 As a complete novel, Two Wolves is the best book I’ve written. It’s the most layered and took me five years to write. 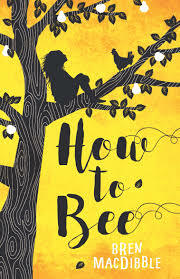 In terms of awards it was a CBCA Honour book, won the KOALA and YABBA kids’ choice awards and was nominated for the PM’s Literary Awards, all of which were an extraordinary surprise. Where are you based and how involved in the children’s and YA literary community are you? I’m based near Byron Bay but I’m very involved in the community in terms of festivals, good relationships with other authors, publishing folk, librarians and illustrators. The web makes it possible, and kids’ authors have so many opportunities to connect at festivals and events throughout the year. It is a genuinely fine bunch of humans. What correlation is there between having been an actor and now a children’s book author? There are quite a few of us – Aaron Blabey, Felice Arena, Judy Nunn and many more. I think it’s useful when writing dialogue and also in terms of imagining yourself into the character’s situation as you write. You need to be able to see and hear and feel and taste and smell the predicament a character is in and render it authentically on the page. An actor’s imagination and improvisation can help with this. Actors learn to play against emotion, too, in order to avoid melodrama. I’m sure that acting helps when bringing the story to life in front of an audience, too. Do you spend more time writing or in front of an audience? I spend about four months of the year speaking, seven months writing and a month off (covert writing time when all the best ideas flow). How have you developed your craft? A good editor is the best writing mentor. I have learnt so much from great editors. That and maintaining a daily freewriting practice alongside my work-in-progress. I’ve read lots of books on writing to understand structure and process. One of my favourites is John Steinbeck’s Journal of a Novel, a series of letters he wrote to his editor while working on The Grapes of Wrath. It’s such a comforting, intimate insight into the daily meanderings, aspirations and doubts that plague the mind of a writer. As well as that, you’re a director. Could you tell us about something you’ve directed? I made a bunch of short films in my mid-20s and then some TV. Learning to analyse scripts and find a personal ‘way in’ to a screen story taught me a lot. The most successful film was Soar about sitting next to the most annoying person in the world on a plane. It was screened at some great fests in the US and Europe and on the Sundance Channel. Now, I make my video trailers for my books and videos for Room to Read, the literacy charity I’m an ambassador for. Exploding Chickens tells some chilling true short stories from my childhood about an evil dentist, a killer clown and a ninja librarian (who wrought revenge on me for having had Fungus the Bogeyman five years overdue from the public library. [It was a very good book.]). The stories star my alter ego, Tom Weekly, and a regular cast of characters, illustrated by the brilliant Gus Gordon (Herman & Rosie). And tell us about the Exploding Chickens competition. What else are you enjoying reading? I recently finished Claire Zorn’s YA novel The Protected which was very good. I’m super-keen to read Robert Hoge’s Ugly and I recently picked up a YA novel called Wolf by Wolf which looks great. I’ve also been re-reading Wonder and listening to David Walliams’ Ratburger as an audio book. 😉 In my writing and reading I drift between serious and funny stuff. What are some books that are really important to you? In terms of serious stuff, Gary Paulsen’s Hatchet and Markus Zusak’s Fighting Ruben Wolfe taught me a lot about writing. The Catcher in the Rye and The Road are the two books that have had the greatest emotional impact on me. They knocked me sideways, unable to move after putting the book down. Stephen King’s The Body made a real impression on me as a teenager – a book with a strong spine and high stakes with well-drawn characters and big ideas. In terms of kid comedy, Roald Dahl’s Fantastic Mr Fox, Paul Jennings’ Unreal, Rene Goscinny’s Nicholas and Tim Winton’s The Bugalugs Bum Thief. What do you dream of achieving or doing in the future? I just want to write great stories. Stories as powerful and humorous as those above. I want each book to be better than the last – each My Life book to be funnier and more true, each book for older kids to be more honest and brave. Someone once said to me when talking about the many facets of a modern author’s life, from writing to touring to social media, ‘The best thing you can do is write a stunning manuscript.’ I place this quote on the title page of every manuscript now. Ultimately, that’s all that matters. Write a better story than the last. That’s my goal. Mid-grade readers, tween fiction, early YA; call them what you will, but books for 8 -13 year-olds must satisfy vital criteria. They require substance, humour be it belly-busting or cloaked as parody, and a completely honest rendering of imagination, no matter how fantastical the premise. Little Chef, BIG Curse and Two Wolves fulfil on all counts. Both are heftier reads for mid to upper primary aged kids (in excess of 200 pages). And ones I could have gleefully gobbled up again immediately I reached the end. 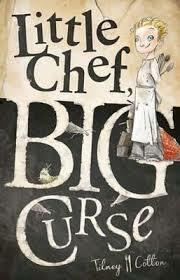 Little Chef, BIG Curse is the debut work of Tilney Cotton and possibly one of the most exuberant reads I’ve enjoyed in ages. I’m not sure if it’s because of the foodie in me or the zealous, ribaldry with which Cotton writes but Little Chef, BIG Curse is utterly delectable and insanely moreish. It’s an off-beat ta le about hapless 11 year-old, Matty Swink who dreams of being a famous chef. He is practically enslaved by the foul-tempered, mean-spirited Fenella as her live-in dishwasher. With no means, family or support, Matty’s future seems confined to sleeping under the sink in Fenella’s diner. But dreams as big as Matty’s cannot be suppressed forever and when the King of Yurp announces a grand Cook-Off and the chance to break a 500 year-old curse on his only daughter, Matty finally forges his way to fame and freedom. This is a zinger of a tale tickling with intrigue, bubbling with soul and simmering with an underlying sinisterness that kids will find electrifying. Cotton’s brilliant mix of colourful characterisation and original one-liners like, ‘roll with pumpkins’ produces a story that is full of punch, flavour and fun. Peppered with a generous helping of comical metaphors (‘breath like dog poo’ is a favourite), sprinkled with danger and seasoned with revenge, Little Chef, BIG Curse has all the humorous and gross ingredients of a Morris Gleitzman adventure and some. 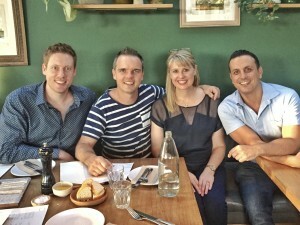 Top notch nosh! That gets 10 out of 10 from me. 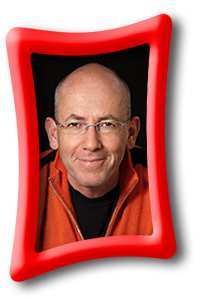 Tristan Bancks’ junior adventure books including the My Life, Nit Boy, Mac Slater Cool Hunter and the Galactic Adventures series rival those of Paul Jennings, Morris Gleitzman and Michael Gerard Bauer. Like kids 8 – 13 years-old, I can’t get enough of his quirky, comedy-loaded, layback style. Two Wolves however is a decisive departure from previous offerings aimed at the slightly older reader, demonstrating more drama, stronger conflicts and more thought-provoking themes. It blew my breath away. Using the Cherokee Indian allegory that we all have good and bad (wolves) dwelling within us as the catalyst for conflict, Two Wolves explores moral dilemmas, innocence versus experience and family blood being thicker than water. Which wolf ultimately wins the internal battle depends on which one we feed, as thirteen year-old Ben Silver discovers. Ben aspires to be a detective but naively lives in a world of limited resources and shaky real-life experience. He re-lives much of his life through the lens of an internal camera, ‘playing on the cinema screen at the back of his eyelids’. This movie-making processing of events allows him to deal reflectively and safely with some pretty confronting issues, the most recent being the inexplicable, unplanned retreat into wildness with his parents. Life on the run with them and his young sister, Olive, soon deteriorates into a painful battle of survival and family ethics. Ben is desperate to figure out what his parents are fleeing from and why but is uncertain of what to do with the truths he may uncover. Ben’s most daunting concerns, apart from remaining alive with Olive, are the choices he is confronted with; right vs. wrong, family loyalty vs. honourable action. How Ben decides to end his movie makes for a gripping novel heaving with adventure and mystery. Bancks’ delivery of Two Wolves is tight and crisp. Fragmented internal thought and observation are favoured over rambling descriptive narrative which keeps the reader firmly in Ben’s moments of extreme agitation. Ben is a believable hero. His naïve, almost tongue-in-cheek humour works beautifully against the darker aspects of this story resulting in a novel tweens can and will relate to even if they have never been in Ben’s situation. Can money buy happiness? What scruples do you possess when it comes to family, or having to confess to a crime? Does deceit ever pay dividends? Two Wolves is destined to keep kids pondering over questions like these for months. Sensational stuff. Ernest Hemingway, famously, wrote standing up. So, too, did Lewis Carroll, Nabokov and Thomas Wolfe (although he died at age 37. Sadly, standing up is not a cure for tuberculosis.) And, since that fateful reflexology session I have tried to inject more activity into my writing process. 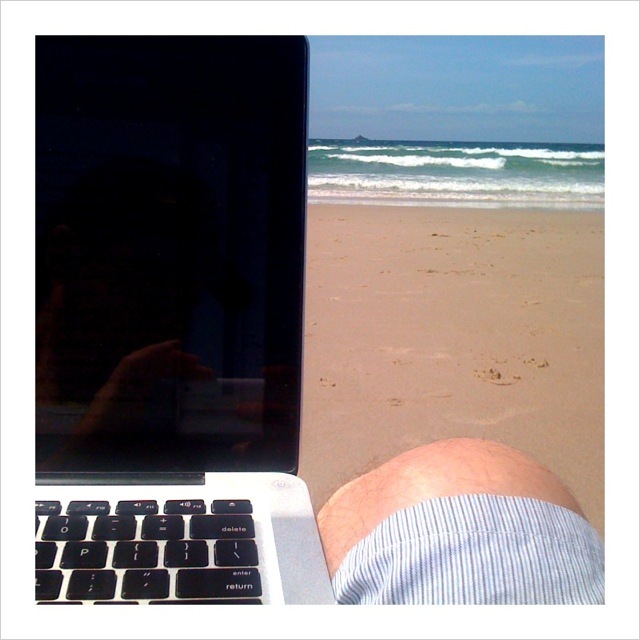 Like many writers, I still sit for too long most days, I still get trapped on the Web, but I believe in the mental, creative and physical benefits of activity, whether it’s beach-walking or yoga, a treadmill desk or simply setting an alarm every hour as a reminder to stand up and walk to the fridge. I like to think that my best work is ahead of me and it would be nice to be alive in order to write it. As I type these words I’m in a restaurant with durian fruit, bananas and chickens hanging all around. I’m on another short stop in Singapore, and I have a good mind to track down that smarmy reflexologist guy with the clicking tongue, and thank him for potentially adding years to my life. Tristan Bancks is a writer and filmmaker. He has a background as an actor and television presenter in Australia and the UK. His short films have won a number of awards and have screened widely in festivals and on TV. Tristan has written a number of books for kids and teens, including the Mac Slater, Coolhunter series, It’s Yr Life with Tempany Deckert, and My Life and Other Stuff I Made Up. Tristan’s drive is to tell inspiring, fast-moving stories for young people. 1. Can you remember the first story you ever wrote and, if so, what was it? I think it was a rip-off of Charlie and the Chocolate Factory in which kids could gain all their essential nutrients by eating ice cream flavoured like meat, pumpkin, brocolli etc. When I visit schools now and run workshops with younger grades I notice that kids are still writing that story. I am considering suing several of them because their work is way too close to my version. Coincidence? I don’t think so. 2. How many novels did you write before your ‘first novel’ was published? My first novel Mac Slater, Coolhunter was published but I had written lots of short films, a couple of un-produced feature film screenplays, hundreds of articles and a number of Educational fiction and non-fiction titles prior to having that book published. 3. What sorts of books do you love to read? 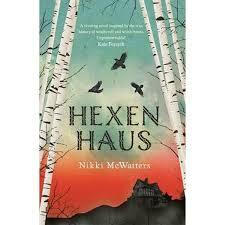 I seem to love page-turning reads with unadorned prose and strong characters that explore an idea. My favourite adult books include Salinger’s The Catcher in the Rye, Cormac McCarthy’s The Road, Hemingway’s The Old Man and the Sea and Jack London’s White Fang. My favourite children’s and middle-grade reads include Gary Paulsen’s Hatchet, Brian Selznick’s The Invention of Hugo Cabret, Markus Zusak’s Fighting Ruben Wolfe and Tim Winton’s The Bugalugs Bum Thief. 4. If you were forced to co-write a novel with someone (as we’re not presuming that you’d want to co-write with anyone necessarily) who would it be? I have co-written a novel, it’s yr life with Tempany Deckert, which really brought the writing process alive for me. I also love collaborating with illustrators. These days, I think I find it difficult to co-write but I would love to collaborate with a Web / Gaming person to build interactive elements into the story as I write. 5. What are you working on now and next? I am working on my third book of weird-funny-gross short stories in the My Life series and, in the background, I am exploring another darker middle-grade crime-adventure book along the lines of Two Wolves. My Life and Other Stuff I Made Up is a short story collection. 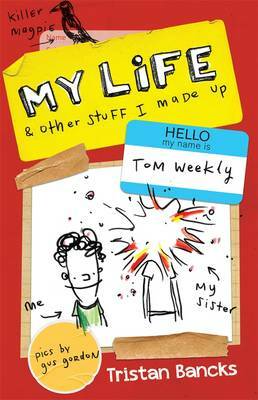 But the stories are linked by the character of Tom Weekly. Can you tell us a little about Tom and how you came up with the character? Tom is, essentially, me. His experiences in the stories all began with something that happened in my life or that felt close to me. Those things are then heightened and embellished in the stories but they carry the seed of me. I didn’t have to write many ‘character notes’ on Tom because I knew him. I was a little boy, too, and, in some ways, I still am. Gus Gordon, the illustrator, also felt very close to the character so, together, we are the two halves of Tom Weekly’s brain. It’s quite a frightening image, actually. What was it like collaborating with fellow actor/author Tempany Deckert on the YA novel It’s Yr Life? It was fun. The book was written via email between Byron Bay and L.A. It’s about two high school students, total opposites, forced to email each other for a school English assignment. Tempany would email me from L.A., in character. I would get her email in the morning and email her back in character, and on it went. We discovered the story through these interactions. The first draft was fun. The consecutive drafts were more challenging because every change by one writer would have ramifications for the other author down the line. But I often get positive comments about the book. We’re currently re-working it and re-packaging for a North American ebook release. You’ve written a couple of books about Nit Boy. What made you want to write about nits? Personal experience perhaps? I had a deeply disturbing, nit-addled childhood and I needed a place to vent my harrowing experiences. Just kidding. I only had them once or twice but they’re all the rage now. You’re nobody in the playground if you don’t have nits. It was particularly enjoyable to write a non-human hero. I scratched for an entire year while writing those books. You’ve written both short stories and novels. Do you have a preference? Short stories are deeply refreshing after writing a longer book. They often arrive in one lump. Not that they are perfect at first draft, quite the opposite. You spend much more time polishing and refining with a short story rather than trying to tie disparate story threads together. But I wouldn’t want to only write short stories. A balance of the two is perfect for me. Top Secret. I could tell you but I’d have to kill you and I don’t want to do that. You’re a nice guy. OK, I’ll tell you. It’s a story about a kid on the run, forced to become a detective as his life falls apart around him. I think it feels different to my other books and the writing process is vastly different, too. What sort of stuff do you like reading and what book are you reading at the moment? I read lots of stuff — children’s and YA fiction, books on Buddhism and creativity, biographies and adult fiction. I am currently reading Flow by Mihaly Csikszentmihalyi, a book on happiness and the creative process. I’m also reading The Search for WondLa by Tony DiTerlizzi (Spiderwick Chronicles author), which is fun. Tristan is about to set off on a literary tour with the Get Reading! programme. 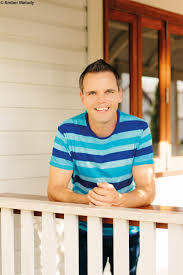 For a full list of his events around Australia (as well as other Get Reading! events), check out the Get Reading! website. Also, don’t forget to take a look at Tristan’s website as well — it’s packed full of info, writing tips and videos. And tune in next time for some Doctor Who. Welcome, Tristan, to Literary Clutter. Can you tell us how you came to have your first book published? I was writing lots of freelance articles on the Australian film industry, interviewing actors, directors and so on, while making my own short films. 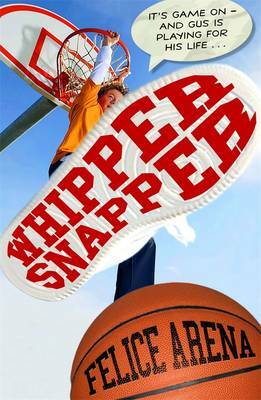 I heard about a publisher looking for authors for a new educational children’s series for Scholastic. I had worked a bunch in kids’ TV in the UK and I can easily tap into my childhood, so I pitched the publisher lots of ideas. They asked me to write four short non-fiction books of around 1500 words each. That was my ‘in’ and I loved it! You have a background in acting. How did you come to switch from acting to writing? I have always written alongside acting. Even at school I acted and wrote and made little films with friends. After school, writing was a constant sideline while I pursued acting and filmmaking. Finally, once I wrote my first children’s book, writing became my focus. I like the lifestyle of the writer more than that of the actor. When writing or performing you are always looking for that moment when you forget the world and forget about time and you are totally immersed in the story. So, at bottom, I think the two are quite similar. Has your acting background been a help to your writing career? I’m sure it helps me when writing dialogue and trying to understand a character. I also think it’s handy when editing because actors are always trying to interpret a story so you hone that ability to ‘read’ a story. 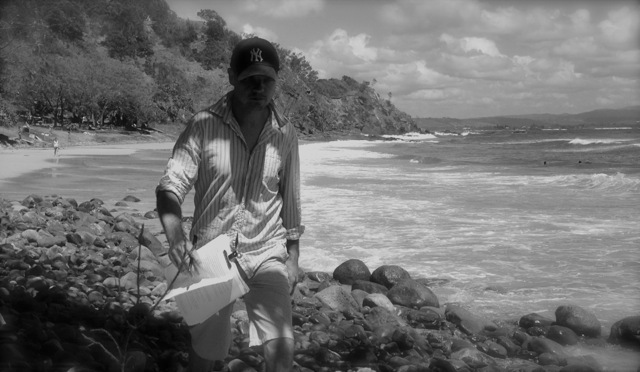 I think writing short screenplays and material for TV has helped a great deal in editing my own work as a writer. In film anything that doesn’t have to be there must be cut. I take that approach when writing books, too. It keeps things lean. Galactic Adventures: First Kids in Space is about an Aussie kid attending Space School and learning to be an astronaut. Is this book the result of a personal dream to go into space? Yes! But, while writing, I started to wonder if I would really have the guts to do it — to actually leave our atmosphere, to head out into the great unknown. So the book began to be about breaking through fear. It came to be about whether you are prepared to overcome enormous obstacles in order to achieve your dreams. I can relate deeply to this. Creative careers are all about walking steadily forward into the dark, having the courage to keep moving forward. I have spent much of my adulthood trying to live the dreams I had when I was a kid. How did you go about researching astronaut training? Reading about all the civilian space travellers who have been to the International Space Station. I read their blogs and watched videos of their journeys and their training. I met Alexis, a French fighter pilot, who provided lots of insight into what it’s like being a young boy with serious dreams of flying aircraft. He gave me insight into what first sparked his interest right through to the grueling selection and training process and the dangers of flight. I went to a friend’s place in the hills and used his high-powered telescope. I went to Sydney Observatory. I flew in many planes and took notes. I read books on space travel and I thought a lot about my own feelings, fears and desires. I collected hundreds of space travel images and pics of space stations past, present and future. I gathered images of the Mojave Desert where the book is partially set. I researched cool HeadQuarters like the Googleplex and Pixar HQ when I was creating the world of my spaceport. I listened to music by Scottish band We Were Promised Jetpacks, French band Phoenix and UK band Keane as I wrote. The energy of their music dictated the high-energy pace of the story. I also listened to Tibetan chants, which somehow tapped the mythical aspects of the story. Wow, that’s a lot of research! I’m exhausted just reading about it. But research is such an important factor in writing a novel — especially one that is set at least partly in reality. It can make the difference between an average read and an engrossing one. My thanks to Tristan for sharing his insights on Galactic Adventures: First Kids in Space, which hits the bookstore shelves today. Interestingly tomorrow will see the launch of the space shuttle Atlantis, in what will be the final launch for the space shuttle program. Tune in next time for part two, as Tristan talks about nits, stuff he made up and working with fellow author/actor Tempany Deckert. 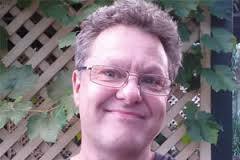 In the meantime, if you’d like to know more about him and his writing, check out his website. Have you ever been kissed by a dog? Ever had to eat Vegemite off your sister’s big toe? Have you had a job delivering teeth? Has a bloodthirsty magpie ever been out to get you? Ever woken up to discover that everything hovers? And have you eaten 67 hot dogs in ten minutes? I have. I’m Tom Weekly. This book is full of my stories, jokes, cartoon characters, ideas for theme park rides and other stuff I’ve made up. It’s where I pour out whatever’s inside my head. It gets a bit weird sometimes but that’s how I roll. Illustrated by Gus Gordon. Film trailers have been around for a long time. They are advertising for an upcoming film, showing some key scenes to interest watchers in parting with their money in order to see the complete film. In recent years, thanks to the popularity of YouTube, we have seen the rise of the book trailer — a short video advertising an upcoming book to potential readers. But what do you put into a book trailer? It’s not like a film — you can’t just edit together a few of the more exciting scenes. You need to actually create content. In effect, make a short film from scratch. Book trailers vary greatly in content – and quality – from simply presenting the book cover with a voice over, to fully dramatised scenes from the book. Of the latter type, here’s one of the best I’ve seen, for Sense and Sensibility and Sea Monsters. I’m willing to bet that this trailer cost a pretty packet. But what do you do if you don’t have a rich publisher willing to throw around bucket loads of money? Well, you could always find a friend or family member to make a trailer for you. Or, if you’re handy with a computer, make one yourself. Of course, this has lead to a glut of really bad trailers being uploaded onto YouTube. But fear not, I have waded through the dross and can now present for your entertainment, some of the better trailers I’ve discovered. To find out more about Rowena and her writing, check out her website. To find out more about Daryl’s animation and book trailer production check out the R&D Studio’s website. “I love making trailers and bringing the world of my books to life. On the Nit Boy book trailer I wanted to build on the work I’d done creating trailers for my Mac Slater, Coolhunter series. I showed Peter Leary, the very talented animator, the books’ amazing illustrations by Heath McKenzie. I then wrote a script. The animator made suggestions. I cut the script down. He made a rough animatic (still pictures with a voiceover) and he began building the 3D characters (essentially, ‘wire’ frames in the computer). I gave Peter feedback on the characters and he created a rough version of the trailer. I then started working on the music with Charlton Hill and the post sound and voiceover with Murray Burns. Peter then supplied the final animation the day before the book launch. The trailer has been an incredibly useful tool for promoting the books. I would say that the key to a good trailer is in nailing the essence of the story in the script, and working with excellent people who know what they are doing. For more info about Tristan and his writing, check out his website. Tune in next time for more trailers. To go into the draw to win these books, just complete the entry form here. Entries close September 30, 2009. A big thanks to our friends at Allen and Unwin, Black Dog Books, Hachette, Hardie Grant Egmont, Pan Macmillan, Random House, Wakefield Press and Walker Books for supporting our giveaways this month. As a kid growing up on a farm on the outskirts of Melbourne, children’s books were my sanctuary. They were the closest group of friends an isolated girl could ask for. They provided me with reassurance and inspiration whenever loneliness got the better of me. The Magic Faraway Tree gave me hope that sheep, snakes and chooks weren’t my only friends. If I looked hard enough, I could find magical lands, pixies, sprites and a cavalcade of fun friends. Came Back To Show You I Could Fly taught me all about city kids and the harmful affects of drug and alcohol abuse, So Much To Tell You showcased bravery and finding your own voice, and The Secret Seven surrounded me with the close-knit group of friends that I’d always pined for. To Kill A Mockingbird transported me to a faraway land called America that as an adult I now call home. So, not surprisingly, the books I’ve written all deal with isolated kids trying to find connection in the world too. I hope they provide kids with warmth, comfort, and a trusted friend when there’s no one else to turn to. The Fashion Police are two shy teen girls who manage to generate new friends and acceptance when they design cool clothes for their peer group. Radio Rebels are a bunch of kids in a small country town who challenge the status quo when they start up a youth radio station. But my new young adult novel, ITS YR LIFE, portrays two teens from vastly different worlds that discover that friendship knows no bounds when push comes to shove. If it weren’t for children’s books, my childhood could have been a very lonely one. But instead, I was surrounded with a slew of positive and inspiring peers. The fact that they were fictional made no difference. In my child’s mind those characters were possibly even more authentic than the real people that surrounded me. For that reason, I love children’s books and I feel very lucky to be able to create new ones. As an author, I’m extremely interested in seeing how publishers use the Internet to promote books for children (and obviously, I’m making notes on what works and what doesn’t). Lots of publishers have tried to tackle Youtube trailers, and honestly, a lot of them involve a swirling book cover and a really horrible voiceover. After watching them, I feel less inclined to hunt down the book. That said, someone recently pointed me in the direction of the new Nit Boy trailer, and it is, hands down, the best original trailer for a book I’ve ever seen. It’s fun, it’s 3D. So, I tapped Tristan Bancks on the shoulder and invited him around to talk about how the trailer was put together. I write quite visually. I see a movie unravelling in my head as I type, so I think book trailers are an amazing way to bring that motion picture alive for the audience. 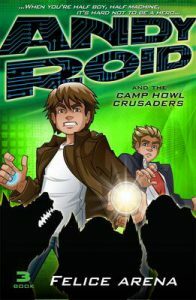 The two books in the series, Lift Off and Bug Out tell the story of blood brothers – Lewis, a kid with the worst case of nits in world history, and Ned, a nit that lives on Lewis’s head. They’re a great way to have a laugh about our favourite blood-sucking mini-beasts. And there’s a nit quiz in the back of each book. With the trailer I wanted to build on the work I’d done creating trailers for my Mac Slater, Coolhunter series. I showed the animator, Peter Leary, the books’ amazing illustrations by Heath McKenzie. I then wrote a script. The animator cut the script down, did a rough animatic (still pictures with a voiceover) and he began building the 3D characters (‘wire’ frames in a computer). I gave Peter feedback on the characters and he created a rough version of the trailer and then a final. I was amazed by how much of the animation comes together in the final render. And, when it was done, it was even better than what I’d seen in my mind’s eye as I wrote the books. A producer has now optioned the Nit Boy books for television and my next visual-literary adventure will be a live-action trailer for the US release of the first Mac Slater book in April next year. Wish me luck!